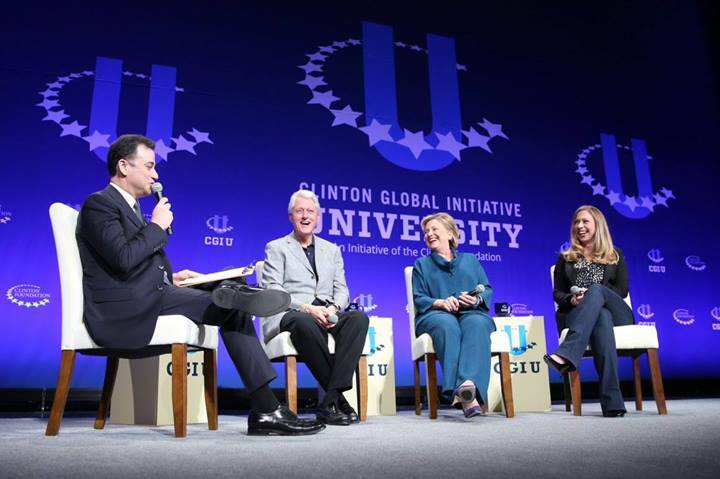 Chelsea Clinton was first on the stage at the Saturday evening closing plenary of CGI U 2014 webcast from Arizona State University. She encouraged participants to join the Day of Action she is leading on Sunday, announced winners of some competitions that had been run in the course of the conference, and encouraged participants to return with their acquired wisdom next time around. More than 690 new commitments came of the weekend events. 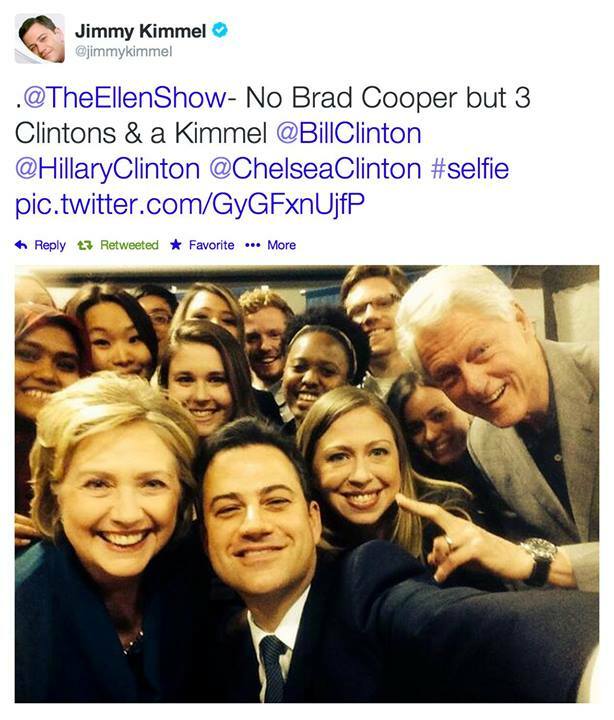 Soon she was surprised by ASU graduate and late night talk show host Jimmy Kimmel who took over the role of moderator. 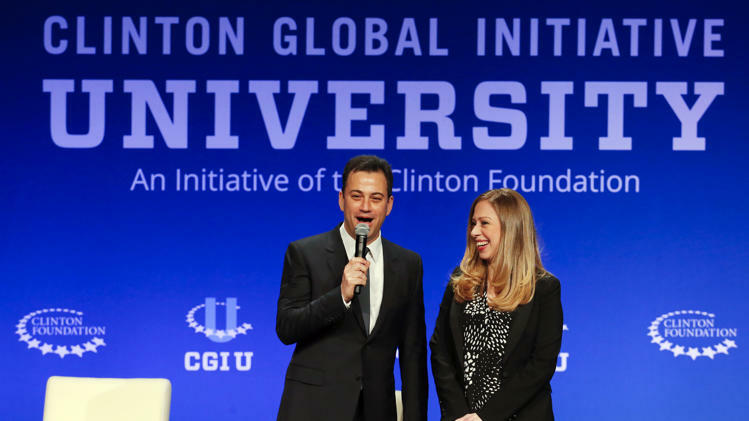 Telling the audience that Chelsea’s parents could not get a sitter, Kimmel then welcomed the rest of the “Super Family” to the stage. Kimmel’s first question was how they became a Super Family. Bill Clinton recounted noticing a girl in a class he attended infrequently at Yale who later introduced herself in the library. Hillary embellished the story saying she heard him before she saw him in a student lounge with vending machines as he bragged about the size of Arkansas watermelons. 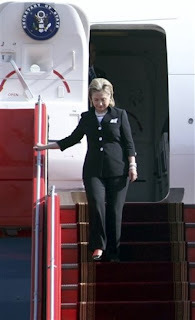 That was in 1971, and WJC said he instantaneously became a women’s rights activist upon meeting her. Chelsea added, with her thanks to vending machines and watermelons, that her first “reader” was newspapers. Kimmel quipped that in his family they read the comics and kept their opinions to themselves. 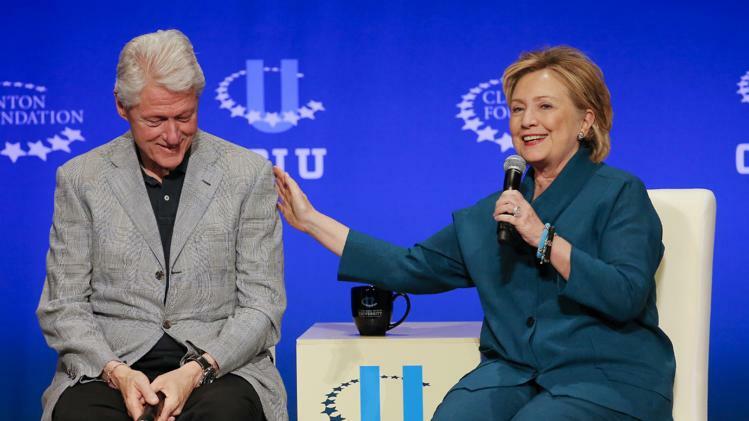 Hillary said that hadn’t worked very well, and Bill Clinton stepped in with some sage advice. He said he had learned that if you try to do something and fail, sometimes you wind up in a better place. 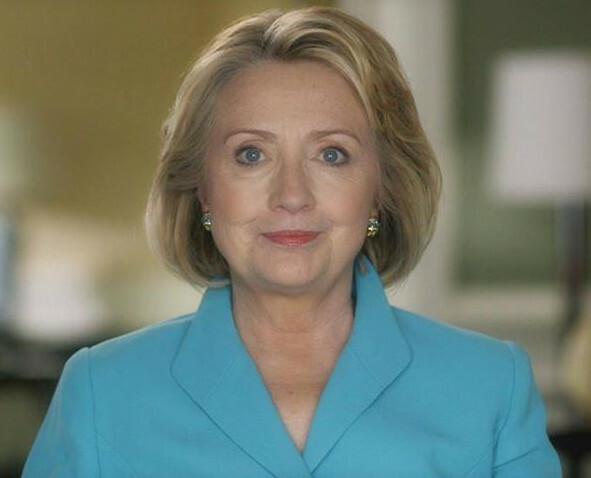 Hillary agreed saying that if you don’t get what you want right away that is the best time to learn about yourself and decide what you really care about. She said both she and her husband wanted to make a difference. 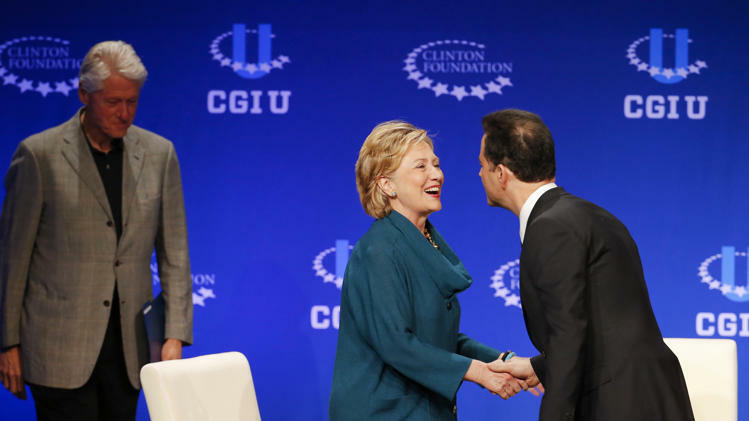 Turning to early political experience , Kimmel asked Hillary about the time at 13 when she called Mayor Daley’s office from the school phone to ask about voting irregularities in Chicago favoring Kennedy. She explained that while she was the one speaking there were actually about 10 students who had been fired up over their social studies teacher’s experience at the polls and traced her activist spirit to her parents and her teachers. She advised her audience to find something they care about and be active. Bill Clinton’s experience came early. At eight he helped his uncle campaign for a local post. 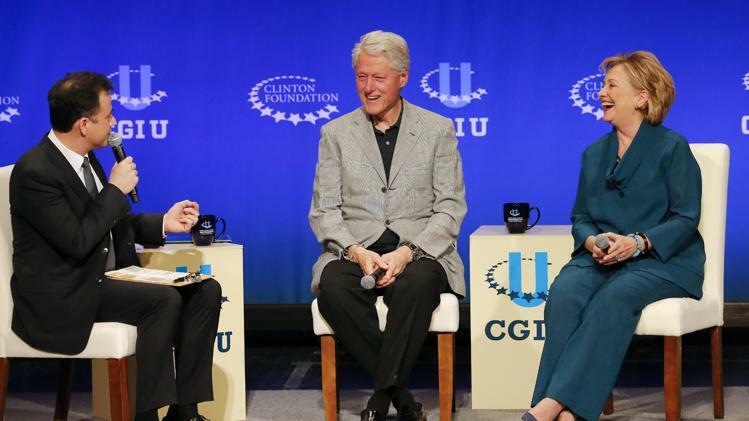 When Kimmel asked what they would say if Chelsea told them she was a Republican, Hillary quipped, “It’s been nice knowing you.” Bill Clinton became nostalgic recalling a primary when he had two opponents and the family played mock debates at mealtimes. 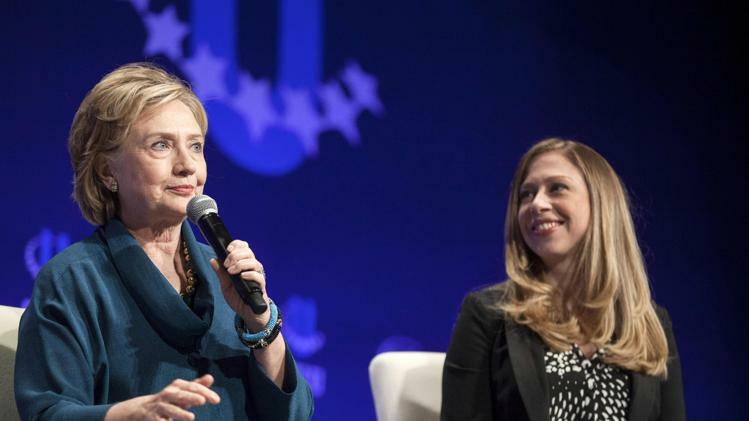 Of Chelsea, he said, “She was a better me than me!” Hillary remembered a similar experience with a shout-out to teachers saying that a teacher who assigned her and her classmate to debate the opposite side of political questions from where they actually stood opened her eyes. She debated LBJ’s side of questions and not long afterwards changed her political loyalty to the Democratic party. Chelsea said her parents were always supportive of her stances as long as she could defend them with evidence, and her father chimed in with an example of how she had changed both of her parents’ minds on a healthcare issue once. Chelsea sees a deficit in civics teaching today and said a big problem is that people do not understand what level of government is responsible for what. Her father, continuing in the vein of hearing from the “other side” said a big problem today is that we do not want to be around people who disagree with us both in real life and on social media. He told the audience that Hillary’s mom, Dorothy Howell Rodham, well into her 90s watched Fox News just to keep her debating skills sharp. Kimmel then asked former President Clinton why he was not painting kittens. Clinton said because he loves what he is doing. He loves creating new opportunities. 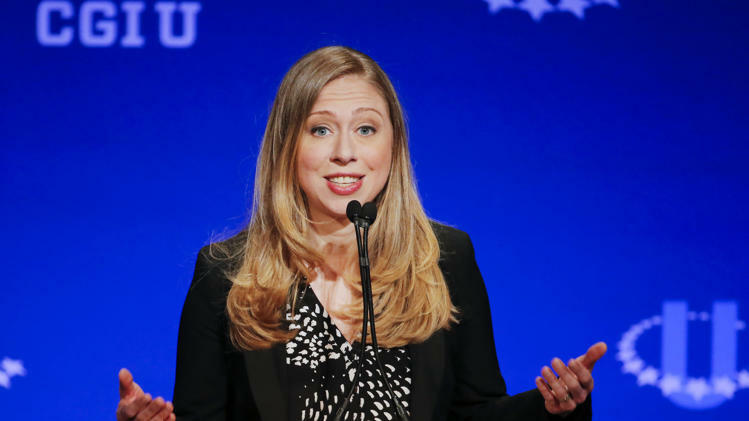 Chelsea said she tried to care about something different from her parents, did not succeed, and is happy to be working with both of them at the foundation. 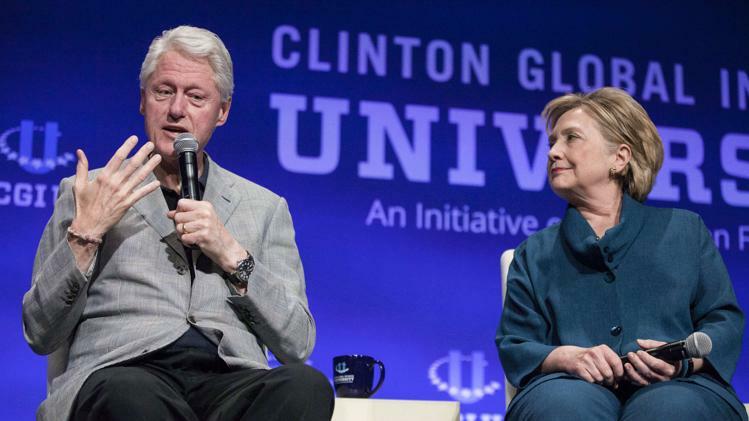 All the Clintons agreed that they love being able to spend time together, and, contrary to what Kimmel thought, can spend some of that time frivolously – playing games and watching bad movies. 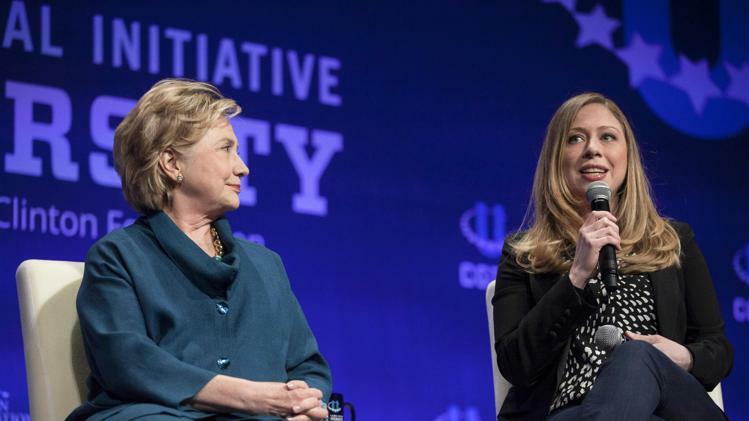 Turning to more serious issues, Chelsea countered a comment from Kimmel about the millennial generation engaging in frivolity saying they are the volunteer generation and that participation is now democratized. Her dad backed her up saying that there are more than a million NGOs and more than half were organized in the last 18 years. He pointed out that social media like Facebook and Twitter are being used to organize behind issues and that they encourage collective awareness. Hillary did not say so at that moment, but given this tweet, clearly she agrees with her husband on this point. Kimmel asked what issues the current audience would be facing in 40 years. 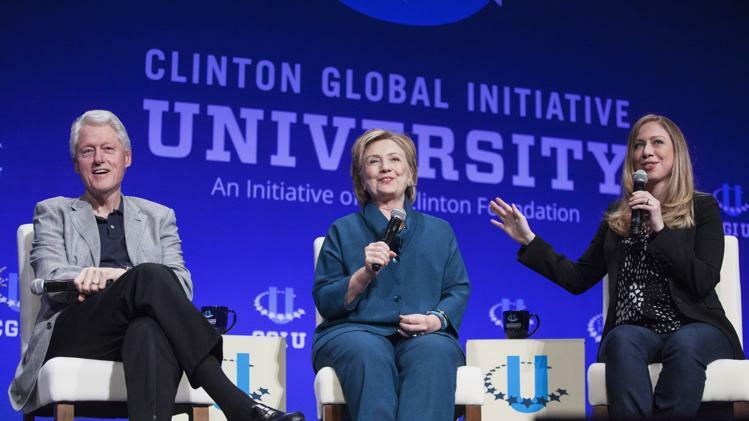 Hillary said it is an issue we are facing right now, climate change, and that she hopes it becomes a powerful political issue sooner rather than later. 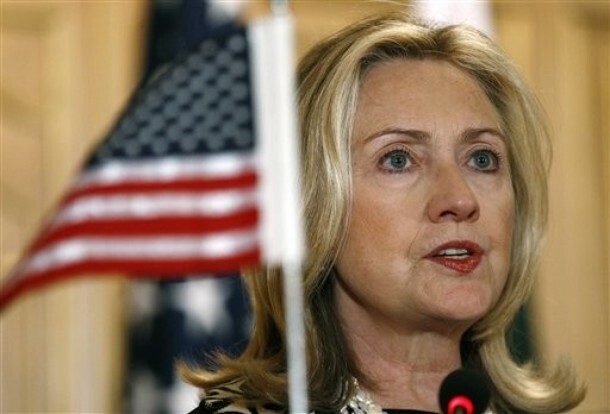 Chelsea agreed and hopes it becomes a global concern the way nuclear weaponry did. She would like to see a mass campaign like the one against nuclear weapons. 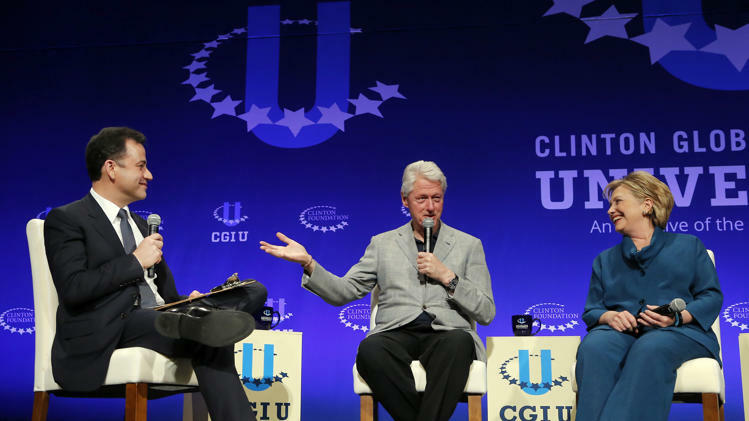 Bill Clinton hopes that 40 years from now people are not still dealing with identity conflicts like the one we see in Syria today and that people will not feel they must dominate some other group of people in order to have a livelihood. He, too, said this is a problem to be addressed now. 1) Health issues can no longer be contained within borders so conquering disease in other countries helps prevent disease here. 2) Climate change has no borders. 3) Economy now is world wide and helping other economies helps support our own. Helping others in a globalized world also helps us. The last question from the moderator concerned unemployment and Chelsea answered saying that there are a lot of new skills programs but that these programs need to be linked to jobs at the end. She also cited the decreasing numbers of women in STEM programs where, of course, the jobs are going to be. More women, she said, need to be encouraged to enter the STEM disciplines. A Q&A followed, and perhaps the most important answer from that session was Bill Clinton’s emphasis on the how question. He said we often know what the problem is. 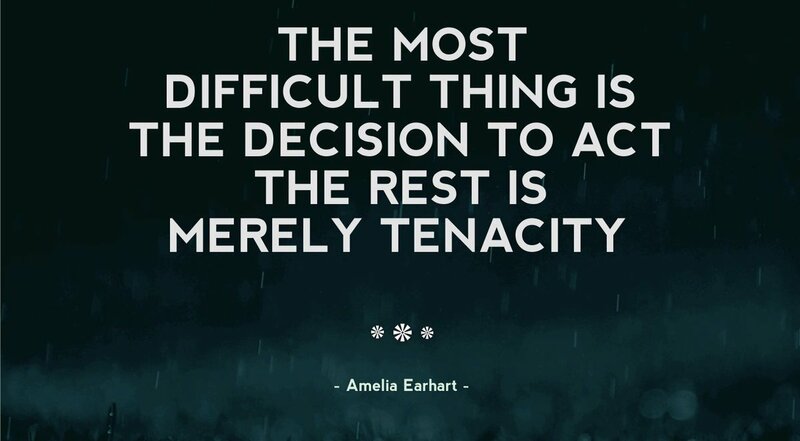 The big question is usually not what we are going to do but rather how are we going to accomplish it. 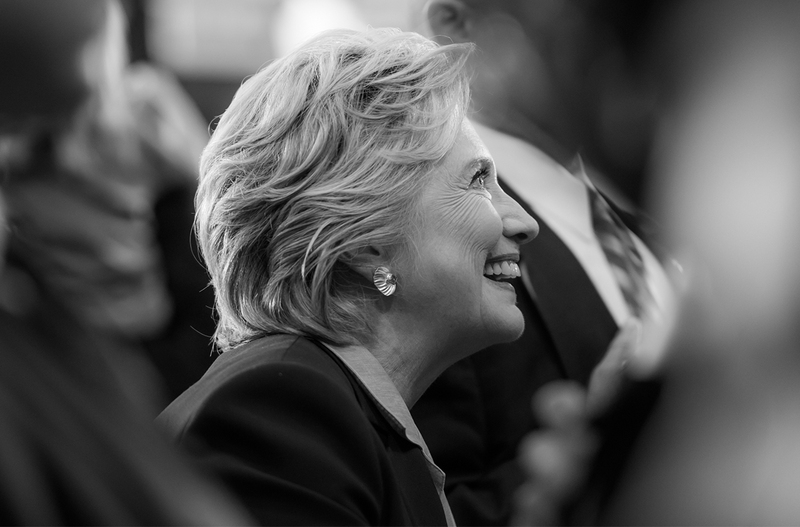 A young woman in the audience asked Hillary “If you don’t represent women in America as future president, who will?” Hillary said she appreciated the sentiment, is concerned about the direction of the country, liked the young woman’s confidence, and is thinking about all kinds of decisions. Chelsea then took the opportunity to throw the question back at the audience and asked them to consider running for office. She said she hoped to be voting for some of them. It was a fitting conclusion to a youth-dominated conference with young folks seeking contact and autographs. 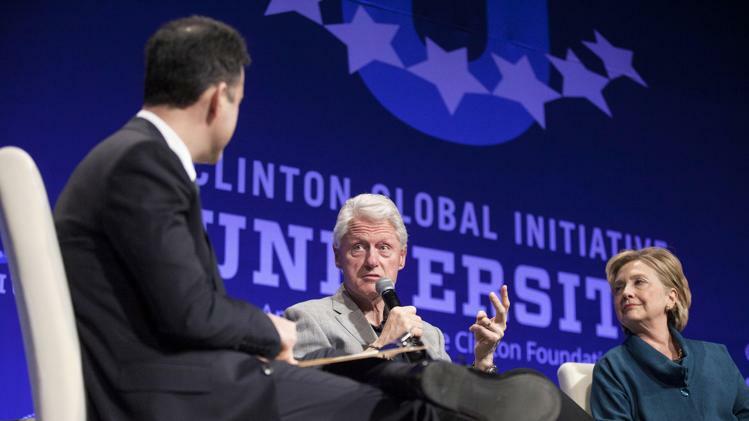 This, meanwhile, was a fitting conclusion to a panel of Clintons moderated by Jimmy Kimmel! Thanks so much Still for your giving us insight to CGI closing event. How wonderful was that. I missed it. so a million thanks. This reminds me of the incredible asset Chelsea was for the young people who supported her mom in 08. Chelsea was a great role model for them and spoke to them on a level that even the candidate, her mom, couldn’t touch. 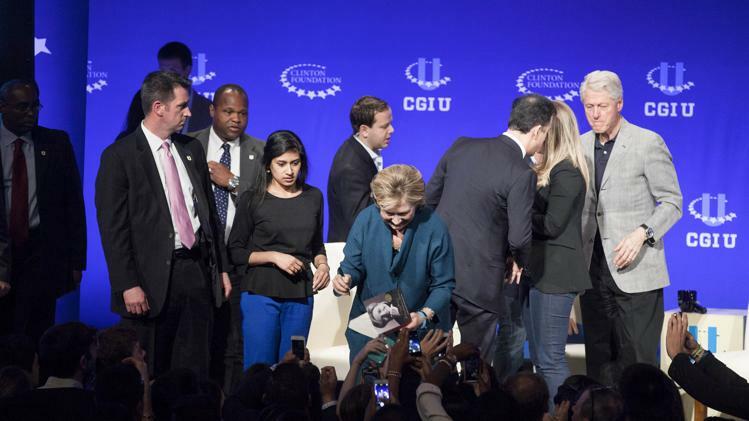 The young faces behind the Clinton family and Jimmy give me hope for tomorrow. I’d rather be in Kimmel’s shoes than in Ellen’s at the award show. He wins. I love that selfie. They all look so cute. awesome read. 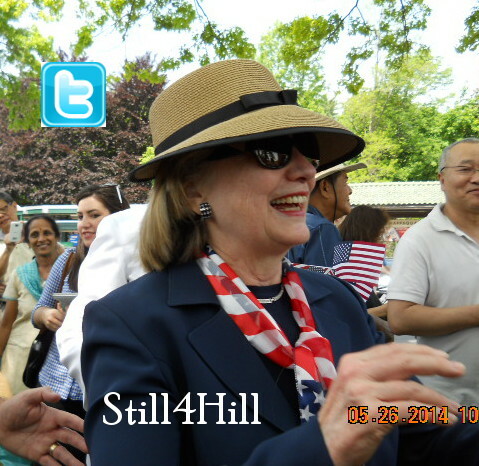 Thank you still4hill. this is where to get the full coverage, for sure. 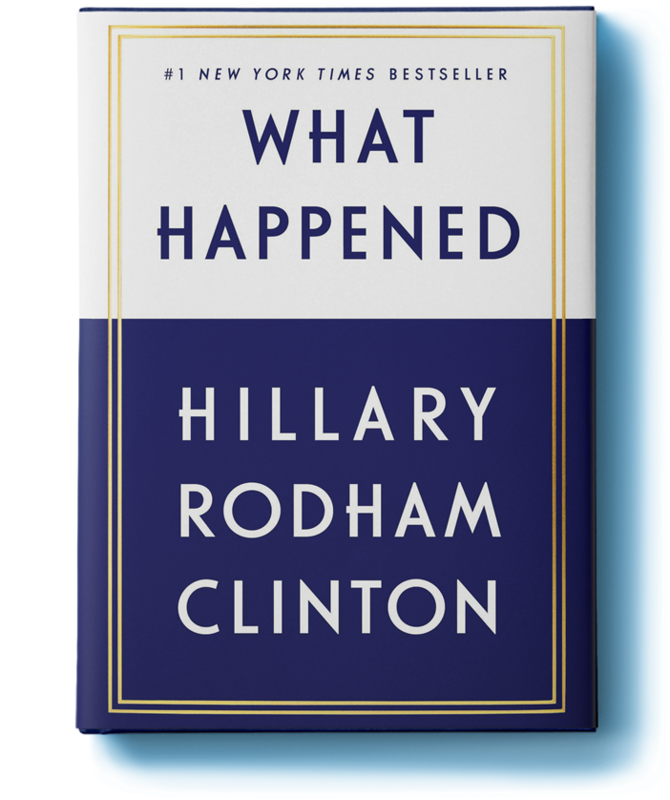 🙂 loved HRC’s response on what if Chelsea were to turn a ‘pub… hahahaha.. the whole summary was a fantastic read. Thanks!! Thank you so much, Sam! It means a lot to me! here’s the video if anyone’s interested. 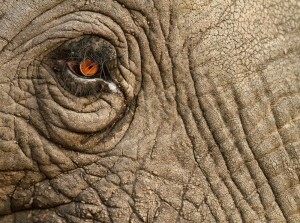 It’s already linked in the first paragraph of this post. so it is! missed that, lol. 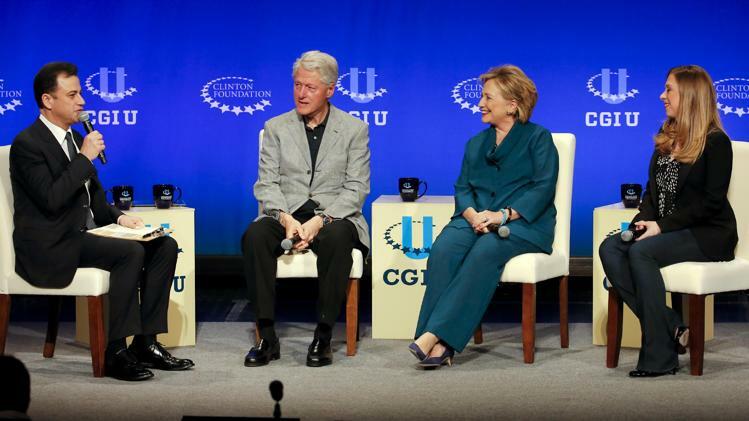 Its so rare to see all 3 of them together, let alone for an hour discussion! Such a treat!!! Hillary Clinton and Chelsea Take Aidan to a Show!